Including many fascinating destinations through the country, this Romantic Honeymoon Holiday will help you get an unforgettable moment in charming Vietnam. A memorable honeymoon in romantic destinations with beautiful nature and friendly people in ancient and peaceful cities, Hue, Hoi An, Halong Bay, etc. Time to learn about Vietnam’s history, culture, art, architecture, etc. Getting to know the local customs and local daily life. Enjoying World Heritages – Halong Bay, ancient Hoi An town and the ancient Capital of Vietnam Hue city. This morning you will transfer to the Ho Chi Minh Airport to take a short flight to Nha Trang. Upon arrival you will check in your hotel and then spend time to relax. In the afternoon you will visit Tri Nguyen Aquarium on Mieu Island. It’s time for you to enjoy hundreds of nice and precious marine creatures. Continue the trip to Mun Island for exploration the best island for snorkeling with lots of lives colorful corals and fish. You will stop at Con Se Tre Island for a fresh dinner. Then come back your hotel for an overnight stay in Nha Trang. Today you will have free time to explore Nha Trang by yourself. It’s time for you to discover the pearl of East Sea with its beauty, natural value as well as nice climate. Maybe you just would like to relax with the facilities and comfort of the resort or enjoy the beautiful fine white sand, warm waters and stunning scenic. Beside you should join in some exciting activities like snorkel or dive among the coral reefs in crystal blue waters, hike along nature trails and so on. Stay overnight in Nha Trang. Today you will have free time to explore ancient Hoi An town. You might just spend time to enjoy the peaceful nature here or interact with friendly locals to know about their culture and their daily life. Beside you should not miss the relaxation on the beautiful Cua Dai Beach. Stay overnight in Hoi An. 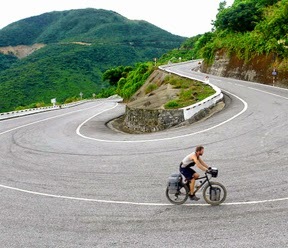 Leave Hoi An and you will transfer to Hue via Hai Van Pass – One of the most beautiful Passes in Vietnam. Upon arrival you will take a tour around Hue city by taking in attractions such as the Imperial Citadel – home to the Imperial City and Forbidden Purple City – once the Emperor’s private residence, the Imperial Museum and the Dong Ba market. Spend time to enjoy dinner at a local restaurant and feel the fine cuisine of the city before an overnight stay in Hue. This morning is your leisure time until leave Hue and transfer to the Airport to take a flight to Hanoi. It’s time for you to explore the Vietnam’s capital with a thousand years of culture and history. This afternoon, you will join in a tour around Hanoi Old Quarter with hundreds of specialty shops which sell many merchandises and products like the name of the street there, such as silk produces, lacquer ware, bamboo, etc. Spend time to shop for impressive modern art in many famous galleries in the city. Your next stops are the Fine Arts Museum and the Temple of Literature. In the evening you will enjoy a traditional Vietnamese water puppet show – a unique Vietnamese art form hailing from Southeast Asia’s wet-rice culture. Stay overnight in Hanoi. This morning you will drive about 3 and a half hour to visit Halong Bay, a World Heritage with thousands of stunning limestone Caves and dolomite islands. Upon arrival, you will take a cruising tour about 4 hours around the Halong Bay to enjoy its breathtaking seascape created by rocky islands and emerald serene water. You will have the stopovers to discover the amazing grottoes. It’s time for you to discover the magical bay where thousands of sculpted limestone islands rise from the waves and know about its legend and have lunch with fresh seafood on board. Then back to harbor and drive to Hanoi for an overnight stay. After breakfast, you can discover Hanoi city by yourself or souvenir shopping, etc, until transfer to the Airport for your departure flight. End of tour services.